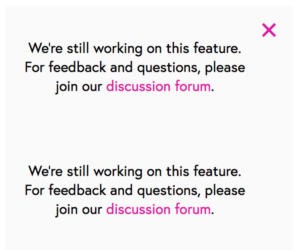 This banner is used to inform users about something important related to the whole service, or to a feature they are working with. Heads-up banners stay on the screen until the user dismiss them. This is to ensure the user receives the message. There is a modifier (.heads-up-banner--compact) that makes the banner a smaller, more discreet version that can be used in places like the course expiry advice message shown in course steps and on the weekly todo list. There is a modifier (.heads-up-banner--fixed) that makes the banner fixed at the bottom of the screen. This is used for the cookie banner.